Inline Oil Heater PPM. Stream oil heating - ! Equipment for Transformer Oil Reclamation. GlobeCore. The PPM oil heating unit is designed for the heating of transformer oil when: (1) adding oil to transformers; (2) replacing transformer oil; and (3) when drying transformers. Additionally, the unit can heat mineral oils, industrial oils, turbine oils and other types of oils as well as non-corrosive liquids. 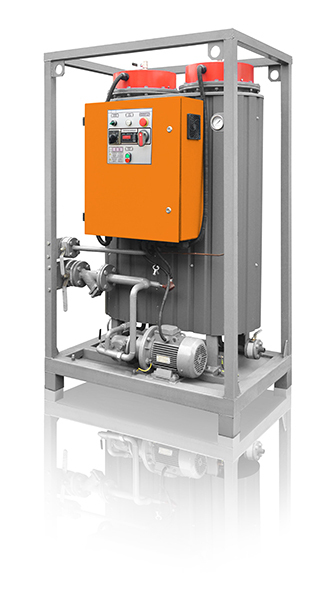 This oil heating unit is best suited for power plants, oil handling facilities, and facilities that perform transformer repairs and maintenance. The unit can be operated either indoors or outdoors under a suitable canopy. The abovementioned oils and liquids should have less than 70 cSt kinematic viscosity at the temperature of 50°C. The CMM-P is also used for heating of petroleum products in the petroleum refining industry, and can also be used for heating liquids containing sand, sludge, etc.